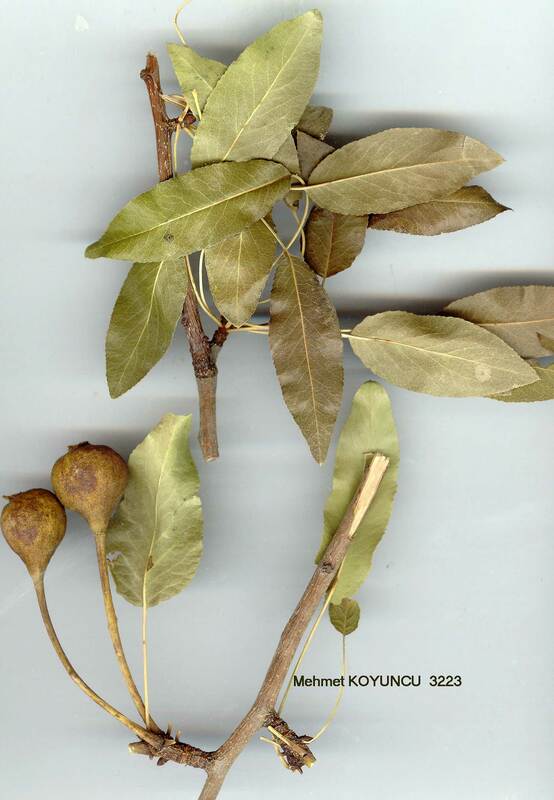 Pyrus syriaca BOISS. var. syriaca BOISS. P. syriaca Boiss., Diagn. ser. 1(10): 1 (1849). Map 33, p. 169. Spinescent tree up to 12 m; twigs glabrous. Leaves narrowly lanceolate to ovate-oblong, broadest in lower half of lamina, (3-)4-8(-9) x 1.5-3 cm, crenate-serrate, sometimes entire in lower part, bilaterally glabrous, lustrous above, dull beneath, somewhat coriaceous; rounded or cuneate at base; petioles up to 5 cm. Inflorescence many-flowered. Flowers white, c. 3 cm diam. ; pedicels thick, c. 2.5 cm, elongating in fruit to c. 5 cm. Fruit subglobose or pyriform, 2-2.5 cm long; sepals persistent. Fl. 4-5. Dry stony slopes, forest remnants, field edges, 500-2000 m.
var. syriaca. Ic: Fl. URSS 9: 71 (1939); Fl. Iraq 2: t. 15 (1966). Syntypes: [Syria] in sylvatici egionis montis Cassii (Akra Da.) supra Cassab, Boissier (G! ); in Antilibano ime Zebdani et Zachle. Boissier.